If matte orange lips for Spring isn’t your kinda thing… how about some coral for Autumn? These new inclusions from New CID Cosmetics… I could handle nicely! It’s that guava-y coral that usually works well on both warm and cool skintones! 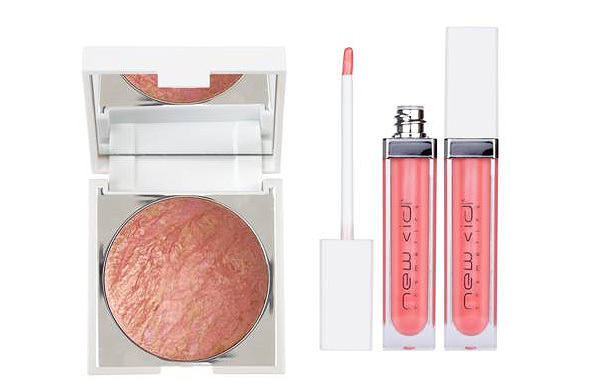 New CID i – glow in Coral Crush (£23.50) offers a perfect ‘pick me up’ for dull and tired skin. The beautiful marbleised baked powders offer an easy, silky smooth application, while the light reflective pigments mimic the skin’s natural radiance. Build up the shade to use as a blusher or sweep across the face and décolletage for a beautiful warm glow. New CID i – gloss in Coral Candy (£15.50) is the perfect companion to keep some sunshine in your life. This pretty shade is suitable for all, creating high-glam shine that really lasts. Featuring built-in lights and mirror for easy on-the-go application, you won’t be fading into the darkness this season! I’m wondering if the i-glow is a more wearable version MAC Stereo Rose for cool, pale skintones. Any thoughts on New CID’s i-glow range? On an unrelated note, I’m positively itching for my new camera to arrive (hopefully tomorrow! )… hurry up! Ooh, thanks for this! I have two of their powders (Sirocco and Ice Pop I think the second one is called) and one gloss, so I’ll definitely get these! Do you rate your powders? Are they mega-shimmery? Some people can pull of coral so beautifully I think they should wear it all year round!! Hmmm, I have the Sirocco shade of the i-glow but I find it so utterly shimmery that I don’t often wear it. I think it’s the shimmer, not the coral shade that would put me off wearing it over winter. Bugger… shimmer was the one thing I was hoping this would have a touch less of. Thanks for the heads up! I lovvveee that you came here to share that and totally empathise with the whole husband not getting it thing! The lipgloss’ colour is GORGEOUS! Ooooh get you knowing your MAC blushes! I’m off to google it! I like coral so I can see it working for fall. Oooh, I think you could be right with the Stereo Rose comparison. Oooh that is a beautiful colour.. but I think it’s a touch too metallic for me Looks amazing on you though!